We still commemorate Veteran’s Day on November 11. 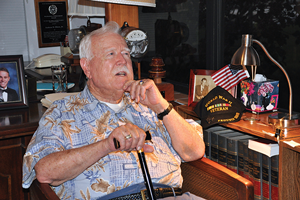 Among local heroes are names like Bill Priest, subject of the November/December 2005 issue of the Northeast Journal, and Charles O’Neil, brother of Judge David O’Neil who served in the Korean war, subjects of the August/September 2015 issue. For this November/December issue, another hero is commemorated: Andrew H. Hines, Jr., perhaps better known to his many friends as Andy. On a pleasant September evening, Andy and his wife Evelyn sat down with managing editor/photographer Susan Alderson and me to share his recollections of a long life and what by Andy and Evelyn, a typical mannerism for both of them. They both excel in extolling graciousness and welcome to their visitors. Andy, third generation Floridian, was born in 1923 in Perry, where his parents operated an ol’ timey turpentine still. He enrolled at the University of Florida as a co-op student working for Florida Public Service Company. World War II changed all of that. He was called up in 1943. 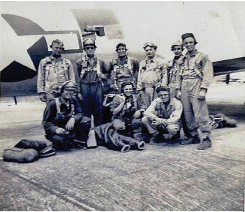 In the summer of 1944, as a brand-new young navigator, he flew to Newfoundland in a B-17 squadron destined for Europe. En route was a stop-over in Ft. Dix, New Jersey. On take-off in a heavy rain storm, plane number one lifted off perfectly. The next B-17 tilted dangerously, then crashed and burst into flames. Andy was in plane number three, already rolling down the runway, so they had no choice but to take off over the burning wreckage. Thus, Andy was introduced to the reality of war. 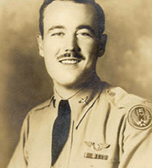 On his 13th mission, in September over Hungary, his plane was hit by enemy fire. The pilot gave the order to jump. The crew had never parachuted, so for the first time ever, Andy was suddenly in midair, suspended by his canopy, floating to the ground along with eight other crewmen who wound up scattered across the countryside. 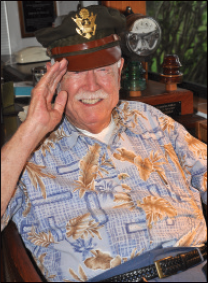 Excerpts from his diary – published on the Florida Humanities Council website called “Florida Goes to War: The Sunshine State in World War II” – tell what happened next. 10 Sept 1944: Shot down while bombing oil refinery 6 mi SE of Vienna. Parachute down from burning plane and land on island in Danube inside Hungarian Border near Bratislav. 12 Sept 1944: Capture by 3 hunters. He was imprisoned in several prisoner of war camps known in German as stalags. While being transferred from Budapest, he was transported in a boxcar to another stalag in Poland. As the war started to wind down, with Russian troops advancing into Poland, they had one-and-a-half hours to evacuate about 1000 prisoners. The Germans allowed occasional five-minute rest stops, as the prisoners were being escorted along icy roads. Andy recalls one lady rushing out of her home with a kettle of warm water to help refresh them because the weather was so cold. One of the prisoners could speak a little of the German language, so he asked why she was doing this. She said she did so because her own son was a prisoner of war in America and he had been kindly treated. She wanted to repay that favor. 27 Jan. 45: Notified (1 ½ hours notice) of proposed evacuation – packed [indecipherable] much food. 28 Jan 45: Left Sagan on 22nd birthday at 0530 – dark, cold, snowing – impressive sight due to glare of burning building 3 km out of Sagan passed Ger. Troops in white smocks some mech equipment – A. T. guns. – many refugees. [indecipherable] the Berlin Breslau autobahn. Arrived at HABLAU about noon and stood in streets til twilight. Snow and cold. Foreign workers – Polish, French, Russians – very friendly. Quartered in chapel in graveyard of Lutheran Church – no lights, cold – ate can of frozen salmon for supper. Was sick this night. A pretty miserable night spent by all. 17km made today. 29 Jan 45: Packed this morning before daylight – a long wait to get started – some of the men bought sleds (improvised) from the townspeople for a couple of packs of cigarettes. We started at the head of the column, directly behind the Gen. and the Colonels. A Hauptman d. LW. was with us. Very cold with wind driving snow cross wind and head wind. On the march we make 5 min. halts every 20 or 30 min. with a 15 min. halt around noon for dinner. The column is very long – 3 and 4 to 5 men abrest [sic], pulling sleds – 1800 men – column close to a mile long or better. Some of the men have diarreah [sic], and other ailments. Today we made 17 km, and halted for night in a farm at SELINGSHRUE on the estate of a Baron who was captured in N. Africa. We slept in the straw and were fairly comfortable and warm. 30 Jan 45: Rested today at the barn. Made some hot choclate [sic] and bullion for first hot drink – except maybe little given by Foreign workers since leaving Sagan. All food supplies are pretty low. We had to leave much food at Sagan because of no way to carry it. The Germans seem to have made no preparations for handling this large a body of men and their organization is poor. Energy today is profiting by this rest, as the next stage of the trek is due to be pretty long. Weather continues cold but somewhat clearer. So far the Germans have provided no food at all for this march. 31 Jan 45: Today we marched 28 kilometer from Selingshrue to MUSKAU. The weather was still cold. We pulled our loads on sleds and told jokes and stories and sang songs to keep our morale up. There is a slight thaw followed by a freeze which renders the surface of the road very slippery and makes travel difficult. The long string of fleeing peasants continue. Some of the country we traverse is hilly causing quite a bit of labor to pull the sleds. We arrive at Muskau very tired at twilight. We were supposed to board trains here, but the [indeciperhable] except for 5 or 6 boxcars. So we stand in the cold for an hr or so till we are quartered in a brick factory – warm and [indecipherable]. Tonight part of the roof came down, and this is indeed a fire trap. Note added at U of F 15 Dec 46 [meaning that the note was added by Andy Hines]. The flag of our country went up @ 1245 29 April 45. 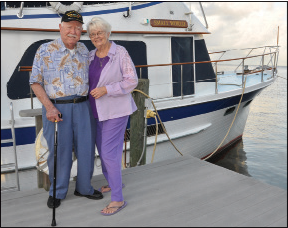 Andy wound up on a troop ship that docked in New York exactly one year after D-Day, on June 6, 1945. He recalls that all of the prisoner experience was enough for one war, yet there was speculation that his unit could be sent to the Pacific. 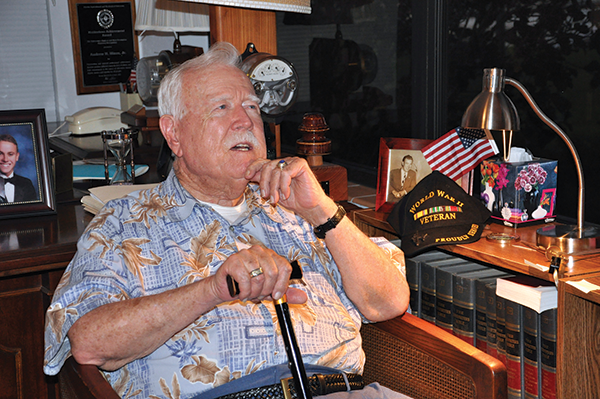 Fortunately for him, Japan’s surrender in August ended that possibility, and he was mustered out, along with the thousands of other soldiers and sailors and airman who had bravely fought in Europe and all over the Pacific Ocean. After the war, the GI bill helped him get back to the university in Gainesville where he graduated with a degree in mechanical engineering. 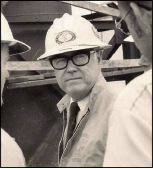 He also returned to employment with Florida Public Service Company, which later became part of Florida Power, eventually working his way up to president and then chairman. His warmth and kindness extends to everyone he has touched throughout his long life. More than once, he would interrupt whatever he was doing during storms and emergencies to personally carry hot coffee to lineman struggling to restore electric service to their customers. His personality and his friendly way of greeting guests underscores his caring for others. After retirement, Andy has devoted much time to community service. He was awarded the Doctor of Humane Letters from the University of South Florida. He has also received honorary degrees from Stetson University College of Law, Rollins College and Florida Southern College. All of his life, Andy has turned to poetry to find expression and sense in what goes on around him, and to write about what he is feeling. There is even a poem found in his diary from his days as a POW. As Susan and I sat in his Florida room, overlooking the waters of Tampa Bay, we were captivated by his engaging smile and the warmth that we felt while discussing his life. 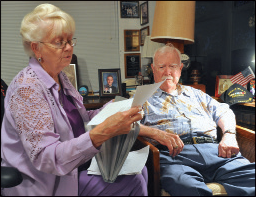 What had been anticipated to be a recitation of war experiences became an evening where he – and his wife Evelyn – drew us into the closeness of a warm chat among friends. Evelyn read from several of his poems, of which there are scores, all carefully filed, with extra copies to give to visitors. Each poem radiates the spirit of Andy’s deep caring for others around him. Earth smoothly spins along its way. Each turn becomes another day. Earth lazily loops around the sun. And as it does, a year is done. I cannot tell which hour is mine. I find it has already passed. And soon it is too late to say. Alike, are sharpened with the years. Eight years ago, Andy lost Ann, his wife of over 60 years. He eventually reached out to Evelyn. They had been friends for many years, and both were now single. Since that occasion, there has been no wasting precious time for a special love – obvious to all who know them – that each will now be there for the other, for the rest of their lives. Information mostly from an interview with Mr. and Mrs. Hines. Some additional subject matter – primarily the diary excerpts – from the Florida Humanities Council website, www.fcit.usf.edu/wwii/hines. Both Andy and Evelyn are very special people who were gifted by God to serve their fellow men. Andy was an incredible leader and civic icon. He was my mentor when I was just a very young employee, one of the few professional women, joined Florida Power Corporation. Evelyn was a distinguished lawyer and a strong role model for many women. It is a blessing that they united in these years.